Please do NOT vote Conservative in the upcoming SODC elections. Vote for residents, not property developers and road builders. ‘Concreting Conservatives’ even acted against their own Party Manifesto which stated they would ‘Maintain the existing strong protections on designated land like the Green Belt. Some that voted against the plan were suspended from the party. Under the leadership of Councillor Jane Murphy we no longer trust South Oxfordshire Conservatives. The only sure way to protect South Oxfordshire is not to vote Conservative at all. Ask your local candidates these questions. Do they want? Before you vote on May 2nd, look out for…. 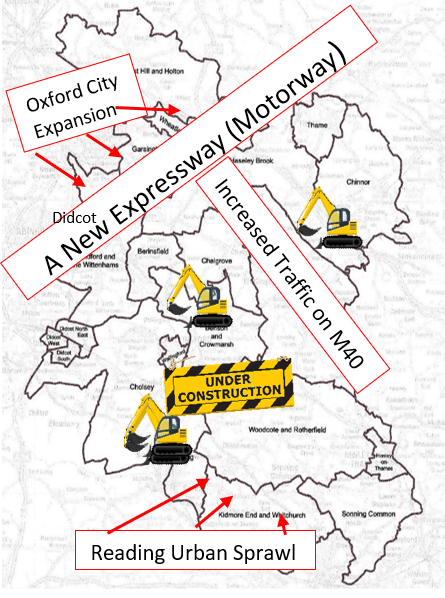 Why are we concentrating our efforts on South Oxfordshire Councillors? Our paper leaflet is promoted by Adrian Townsend, 52 Wheatley Road, Garsington, Oxford, OX44 9ER for and on behalf of A better South Oxfordshire. It was printed by Parchment Print of Oxford, Printworks, Crescent Rd, Cowley, Oxford, OX4 2PB.